The key to APeX Water is that oxygen molecules are bonded to the silver core, by a Covalent Bond, and through the use of the silver nuclei, the oxygen is delivered, past the cell membrane, into the heart of the cell. 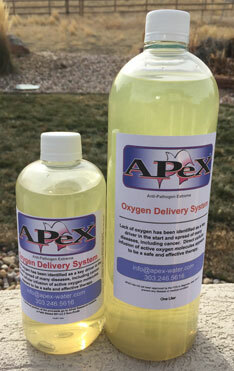 APeX Water is a direct cellular infusion, oxygen delivery system. It has the ability to specifically rout out pathogenic cells, and then, one-by-one, destroy them, without any toxic residue to healthy cells. Items often purchased with APeX Water: portable Nebulizer.